Highland County commissioners Terry Abernathy, Jeff Duncan and Terry Britton are pictured at Wednesday’s meeting. 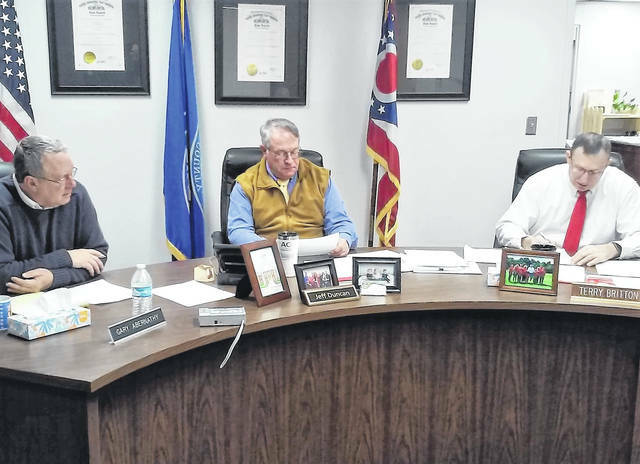 Saying it wouldn’t be appropriate to force people to come to work if the roads are unsafe, Highland County Board of Commissioners President Jeff Duncan advised county employees to check with department heads on days when a snow advisory has been issued. He said the decision would be up to department heads as to whether or not county employees would be required to show up for work on days where roads have been deemed hazardous for travel, and if the employee judged them to be too risky, to plan on using a comp day or vacation day. As previously reported in The Times-Gazette, Highland County Sheriff Donnie Barrera recently reinstituted a three-level snow travel advisory scale for county motorists. Level One is a basic snow alert declaration by the county sheriff stating that while no roads are closed, unnecessary travel is discouraged, but if deemed necessary extreme caution is urged. Level Two advises that all or specific roadways in the county are hazardous, and only persons who deem it necessary to travel should be on the road. A Level Three condition is declared when ice and blowing snow have created extremely dangerous travel conditions, causing some roads to be closed. According to the Ohio Revised Code, no one should be on the road during a level three emergency except for police and emergency personnel, and those traveling the roadways without good reason could be prosecuted for misconduct at an emergency, a fourth-degree misdemeanor. In other matters, Commissioner Gary Abernathy told colleagues that plans are progressing normally on the back-up system for the county’s emergency 9-1-1 system. “One of the questions that came up was whether or not we were under contract with AT & T for the back-up system,” he said. No contracts were discovered with the county or the communications corporation, which paved the way for the county to change providers. Highland County Auditor Bill Fawley was also in attendance at Wednesday’s meeting, and announced that property tax bills would be in the mail Friday, with a payment due date of Friday, March 1. Also Wednesday, commissioners approved nine resolutions, seven of which were line item budget transfers. Commissioners also approved a pair of contracts, one being an agreement between Highland County and the Village of Mowrystown for the housing of prisoners.